I stalked the WeatherBug app the days leading up to Foot Locker (South) like a child tracking Santa on Christmas Eve. I prayed for the temps in Charlotte to rise and the rain to move out! Predictions earlier in the week included a few hours of frozen precipitation in the pre-dawn. Saturday morning at 6 a.m. the forecast was confirmed - wet and cold. I asked Jake for third time in the past 24 hours if he was SURE he wanted to run. "The backpacks are camo this year - you don't like camo. Are you sure you want to run?" He replied, "Yep." Based on the forecast and a coughing sibling, we decided to leave the rest of the family (and dog) at home. A Mom's Perspective: What's in Your XC Bag? I-85 was a mess. Rain, fog, and the uneven pavement for the many miles of construction zones made for a long drive. Finally, we made it to the long line of cars waiting to turn into McAlpine Park. I was hesitant about being in this line. I have been a victim of waiting in the line only to circle the parking lot and be directed back out to the Elementary School to wait for a shuttle more than once in the past. A text from an fellow experienced XC mom read, "This is awful. Knee deep mud and can't get to the bathrooms." Heading the warning, I pulled out of the turn lane and headed for refuge at a nearby Walgreens. We took advantage of the clean, warm restrooms and picked up some hand warmers. I sent a quick text to my friend, Wendy, to see if she needed anything. She asked for paper towels. Not sure if it was a joke or not, I grabbed some. I asked for a few extra bags at checkout thinking we may need a place to put wet running shoes. We then found a parking spot at the Business Park and began the trek to the meet. As we attempted to cross the first of many mud pits, I asked Jake again if he really wanted to run. "We can just get your back pack and go home! Are you sure you want to run?" To which he replied, "Yep." About this time we started passing runners that were leaving or cooling down from an earlier race. They were covered in mud. COVERED! I told Jake, "Just embrace the mud and have fun today! No one can PR in this mess." At this point, I wasn't expecting a PR, but I was expecting it to be race to be remembered! As we crossed the bridge to the heart of the park, we were greeted by a sea of mud. Everywhere, mud. Everyone, covered in mud. Mud. The thick, goopy, brown, slimy mud that made slurping noises when you walked kind of mud. (Boy was I ever grateful that I braved my daughter's room this morning to retrieve my Duck boots.) Thankfully, the rain had started to ease up as we looked for the runners check-in tent. The mud there was an extra-special kind of mud. Carolina red clay mixed with quick sand and slime. I glided across the mud almost as if I were on ice skates, picked up his chip and number, and of course the coveted camo and rainbow backpack. (Isn't that the only reason anyone really runs Foot Locker?). After trekking through the waist deep mud (slight exaggeration) we found friends and teammates. The parents new to the sport of XC where in obvious shock. They seemed to cling to the bleachers like a life raft from the Titanic. The warm-ups began. And I proudly whipped out my roll of paper towels! Wendy hugged me. She tried to wipe off her new white running shoes. They are now a fine shade of Carolina Mud. She is a runner though. She never expected them stay clean. The paper towels were passed around and we wiped off the wet muddy mess on the bleachers. Eventually, trainers and sweats were shed and sparkling new spikes christened. Those extra bags from Walgreens, were suddenly more valuable than gold. We crammed everything into their bags, (I now have three backpacks and a roll of paper towels to carry around) and trudged our way through the newly formed motes, ponds, rivers, quick sand, and mud pits to get to the start line. Wendy and I began to strategize the best plan of attack for viewing and cheering on our boys. The mud had crept over the top her shoes by this point. No point in even trying to navigate the mud. We just went straight on through focusing on not losing our balance. We laughed with a few people that failed to remain upright while trying to climb the spectator side of "the hill." We determined divide and conquer was the best strategy. On a normal day, we could make the 1 mile, the hill, the 2 mile and finish line if really hustled. But today, in the freezing cold, wearing duck boots and three backpacks, I opted for the across the small pond view of them coming down the hill, the 2 mile mark and hopefully the finish. Wendy went to the 1 mile and then to the straight away in front of the lake and finish. Surprisingly, most of the course was in really good shape. At least it was much better than the spectator areas! The race was great. It was fast. It was cold. It was wet. And it was muddy. Jake navigated the course for only the third time in his career like it was his home course. He conquered an all time PR the first time he wore spikes in race. (Thanks Greenville Running Company!) An added bonus for him and his friend Adam, Wendy's son, were medals. They had persevered through a long season, and voluntarily added an additional three weeks of training to run one more race - Footlocker South. We were proud XC moms. We were proud of the mud that adorned their legs, backs, shoulders, ears, and even eyebrows. The mud was a symbol of accomplishment. The real win of the day though was the memories we made. Jake may run more than a 100 races in his high school career and only remember a few. I am certain that this will be one of the few. It was miserable, there was mud, it was freezing. But we embraced the core elements of the true sport of XC. We laughed when we slipped. We took pictures of the port-a-potty mud-ocean and selfies with the start line. 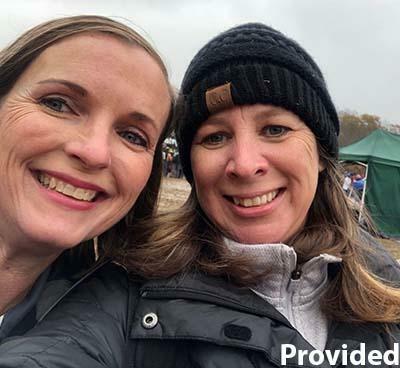 We were grateful for what years of experience as runner moms had taught us and learned more about being prepared for mud in the future. (Paper Towels will be added to my Mary Poppins meet day bag forever.) Because in the end, it isn't so much about their time, their place, or even the medal. It is about teaching our kids to work hard to attain a goal, making the best out of the worst and never making excuses. It is about making memories with your kids. "Aren't you glad you ran today?" Post Note: My daughter, Sydney, ran in the same race as Samantha Davis at the Hare and the Hound at McAlpine Park this September. It was difficult for me to return there. To know that someone else's child stood beside mine on the start line but didn't cross the finish shook me. I was fearful I would be overcome with emotion returning there. We wear bracelets that say "Run the last 1K for Sam." It is a reminder to us to be grateful for the moments we do have together, for the ability we do have to run, and to know that we are not guaranteed tomorrow. Sam's faith in Jesus is a comfort to those who miss her. 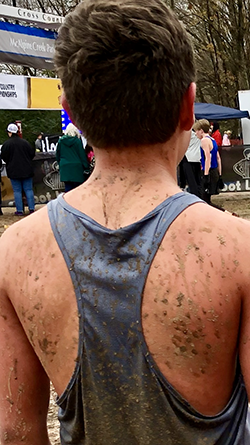 Returning to McAlpine Park in the mud was a reminder to me that Jesus can take the muddiest of us and turn us into someone worthy of a gold medal, worthy enough to enter the gates of heaven. I pray you know that Jesus will love you even if you are covered in mud. He will make all things new. McApline Park holds a special place in my heart, mud and all.